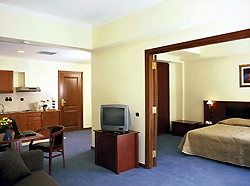 One of the very best hotels in Athens is located on 9-11 Lysikratous, a quiet street near Amalias Avenue. The AVA Hotel Athens Apartments and Suites has an excellent reputation. It offers the comfort and amenities of an upscale hotel combined with an exclusive personalized service. AVA Hotel Athens gives you the privacy of your own home. No wonder AVA has been topping all the charts in terms of guests' preference and satisfaction. The location of AVA Hotel Athens is perfect, just a few steps away from the Acropolis with its magnificant Parthenon, Hadrians Arch, the Temple of Zeus, the Zappeion and the Panathinaic Stadium (Kalimarmaro). The monument of Lysikratous is just down the road. 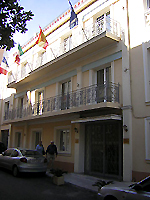 Situated in Plaka, the most exclusive and prestigious area of Athens, this non-smoking hotel is right in the middle of the historical centre. AVA Hotel Athens Apartments and Suites is within a ten minute walk of Contitution (Syntagma) Square with the Greek Parliament and the famous Evzones guarding the Tomb of the Unknown Soldier, the National Garden and the exclusive shopping areas of Kolonaki and Ermou. 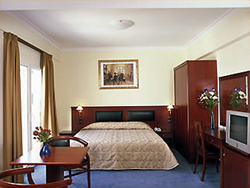 The hotel has special offers and reduced rates for long stays. You have special requirements for occasions like an anniversary, birthday or a weddding? AVA Hotel Athens will go the extra mile to make your stay a memorable one. The comfortable and spacious apartments and suites of the AVA Hotel are attractively decoraded with high quality furnishings, wall to wall carpeting, balconies or verandas with magnificent views, noiseless central air-conditioning, central heating and deluxe bathrooms. 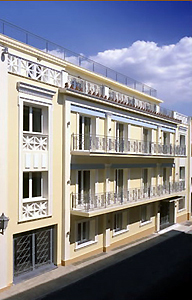 Being self contained the AVA Hotel Athens Apartments & Suites is ideal for a pleasant short or long stay in Athens. Regular apartments for 2 or 3 (max.) people are on average 32 m² (345 ft²). They have a bedroom with a king size bed or twin beds, a living area, a kitchenette, a private bathroom and a small balcony. The Executive Apartments of the AVA Hotel Athens can comfortably accommodate up to 5 people and are between 50 and 55 m² (540 to 600 ft²). They consist of a bedroom with a king size bed or twin beds, a living room with a pull-out double sofa bed, a kitchenette and a private bathroom. An extra roll-away bed is available upon request. All apartments have balconies with direct view on the Acropolis, Hadrians Arch and the Temple of Zeus. 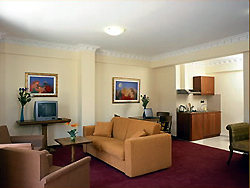 The AVA Suites can accommodate up to 4 people and are on average 55 m² (592 ft²). They are decorated with high quality neo-classical furniture.The AVA Suites consist of a bedroom with a queen size bed, a living room with a pull-out double sofa bed, a kitchenette and a private bathroom. An extra roll-away bed is available upon request. All AVA Suites have large spacious verandas (20 m² / 215 ft²) with view on the Acropolis, Hadrians Arch and the Temple of Zeus. They are equipped with balcony furniture so you can enjoy the breath taking view, the Greek sun and your stay even more.